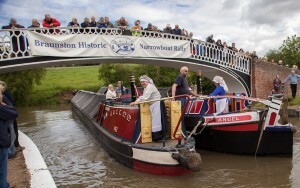 The 10th annual Braunston Historic Narrowboat Rally was held over the weekend 23-24th June 2012. The event is very colourful, all boats being polished to look their very best. Its setting is down a hill from the small village of Braunston, near Daventry, to which the views are stunning on a sunny day. Unfortunately my visit on the 23rd was not blessed with much sun but luckily no rain. This year there were less visiting historic boats – around 75 compared with around 115 last year. As a result the parade of boats went more smoothly and largely without the choking congestion of 2011. I was told by a reliable source that this was due to water shortages for locks and 40 more boats were moored on the river Weaver at Northwich in Cheshire. The boats create a historic scene and there’s plenty of stalls with canal related things to see and buy! There’s a beer tent with a band and a range of catering stalls. One boat particularly worthy of mention is Ilkeston* from the National Waterways Museum at Ellesmere Port. It was built as a horse-drawn boat in 1912 for Fellowes Morton and Clayton Ltd, the largest and best-known canal transportation company in England. The cost then was £190! As engines replaced horses, Ilkeston was converted to a butty and towed by steam powered boats. The recent restoration of the boat has been partly carried out by heritage Lottery funded young trainees – excellent! The boat is on its centenary celebration trip from Ellesmere to the London Canal Museum. Here is a slideshow of my photos of the event. *For pictures about Ilkeston’s restoration click here. For the press pack on Ilkeston and its centenary journey click here.